This recipe comes to MrBreakfast.com courtesy of our friends at Driscoll's Berries. Checkout driscolls.com for a great collection of berry recipes for every meal. Preheat oven to 400 degrees F. Place paper liners in 18 muffin cups. Whisk whole wheat flour, all-purpose flour, brown sugar, oat bran flour, flax seed, baking powder, baking soda, cinnamon and salt in a large bowl until blended. Stir yogurt, oil, eggs, orange juice and vanilla in a small bowl. Stir yogurt mixture into flour just until moist. Fold in blueberries and raspberries just until combined. Divide batter evenly into prepared muffin cups. Bake 20 minutes or until toothpick inserted in center comes out clean. Remove muffins from pan and cool completely on wire rack. Helpful Tip: Over-stirring muffin batter tends to cause peaked tops. Use a flexible spatula or wooden spoon to combine wet and dry ingredients, and gently fold in the berries to avoid crushing. Driscoll's is a fourth generation family-owned company that has been involved in berry farming for over 100 years. As the leading provider of fresh and organic berries, Driscoll's works with independent farmers to produce the highest-quality berries in the world in an effort to continually delight all berry consumers. Driscoll's is the preferred berry partner of some of America's leading chefs and culinary institutions. 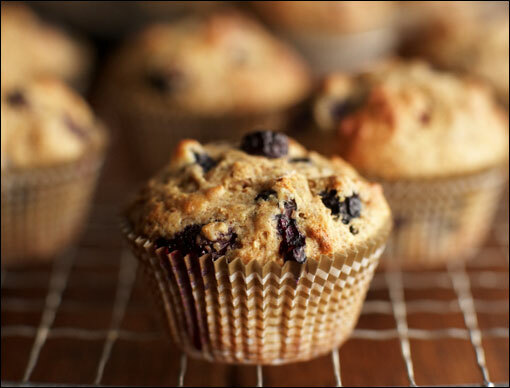 A berry delicious and berry healthy muffin recipe. Makes 18 muffins. Prep Time: 10 minutes. Bake Time: 20 minutes. Recipe courtesy of Driscoll's Berries. Mr Breakfast would like to thank FinestBerries for this recipe. Recipe number 2864. Submitted 6/23/2010.